It is essential to know your horse's normal pulse, respiration rate, and body temperature. Knowing what is normal for your horse is helpful if you need to determine if it is having respiratory problems or is developing a fever. You'll also be able to help the veterinarian, should your horse need treatment, by providing accurate information. Pulse and respiration recovery rates are an indication of a horse’s fitness level and are used extensively in sports where horses are working hard. Some sports even involve the use of heart rate monitors that are worn while the horse is being ridden. Normal pulse range: 28 to 45 beats (count the double 'lub dub' as one full beat) per minute. These values are general normal ranges. Check your horse over several days at different times of the day to establish the normal pulse, respiration, and temperature ranges for your individual horse. Keep in mind that the air temperature can influence your horse's body temperature. If it is very hot, a horse's internal temperature may increase slightly. Take its temperature at cooler parts of the day and average the readings. If your horse is anticipating a treat or suppertime, you may see a slight increase in pulse and respiration. Or if your horse is a bit stressed, such as being separated from a buddy, in the trailer or at an event, you may see elevated PRs. If your horse is very relaxed, you may get respiration readings as low as four breaths per minute. Pulse and respiration are also useful for monitoring your horse's fitness. The faster your horse's pulse and respiration or "PRs" drop after exercise, the more fit it is. Take your horse's PRs immediately after exercise and then every few minutes thereafter so you get an idea of how quickly the values are dropping. If the horse’s pulse rate returns to normal values with a very short time, it can be an indication of a very fit horse. If the pulse takes a long time to return to near normal, it can mean the horse is being overworked. A stethoscope is the easiest way to count heartbeats, although you may be able to feel it with your fingers on the large blood vessel beneath the cheekbones. Be careful you don’t count your own heartbeat by using your thumb. In a pinch, you can even make your own stethoscope. Heart rate monitors–which can be held in your hand or worn by the horse–make taking your horse's pulse much easier in working conditions. Be careful while counting breaths that you don’t count sniffs. This is sometimes difficult, especially if the horse is away from home and there are many new things to smell. 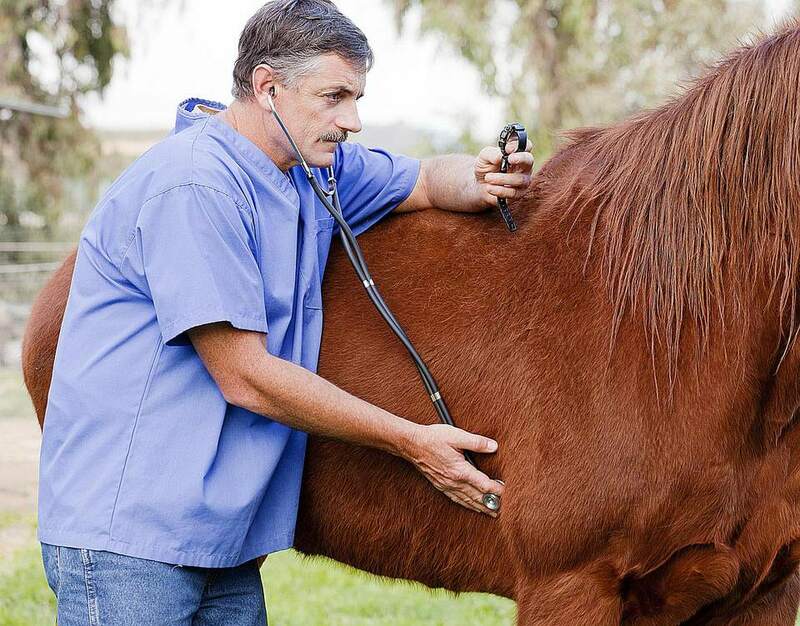 Don’t count breaths from the twitching of the nostrils but either with a stethoscope on the underside of the neck or by watching your horse’s sides. Temperature is affected by work and the air temperature. If your horse is standing in the sun on a hot day, you can see a slight increase in temperature. Too long in the sun and heat could cause heat stroke. Of course, your horse may also be running a fever, so watch for other signs of illness if workload and air temperature aren’t the cause of increased body temperature. You may find the values slightly higher in ponies and very young horses. Again, this is why it’s important to take your horse’s TPRs while it is healthy and over a number of days to find the average. If your foal appears to have an elevated temperature, it’s cause for immediate concern. Call your veterinarian to check for illness such as rotavirus.